The Inquisitor: The creator and director of a true-crime Netflix series talks about her two-year investigation of false confessions and her motivations for telling criminal justice stories. An interviewer leans in close, toward a middle-aged Michigan woman. It’s ten hours into the interrogation of Karen Boes, whose teenage daughter has died in a house fire. Police suspect Boes of arson—and of murder. But she is not under arrest. There’s no physical evidence to implicate her. She submits to the interviews voluntarily and repeatedly asserts her innocence. Boes even agrees to a polygraph. But after hours of questioning, her certainty dissolves. Police tell her she’s failed the lie detector test. She seems exhausted and confused. “I apparently did it,” she says at one point. “What makes you say that?” says the interviewer. Boes’s belief in the polygraph has shaken her belief in her own memory. And then the interview teeters into another realm: a dreamscape of alternate narratives. “If you did dream about doing this, how would it happen?” says the interviewer softly. Boes’s hands are covering her face. She tells a story about sprinkling gasoline and lighting a candle. Is she describing a dream, a trance, or a memory? It seems unclear, even to her. “I guess that I just went insane and lost it,” she says. That’s a scene from The Confession Tapes, a new true-crime series from Netflix. The documentary permits its audience no certainties. 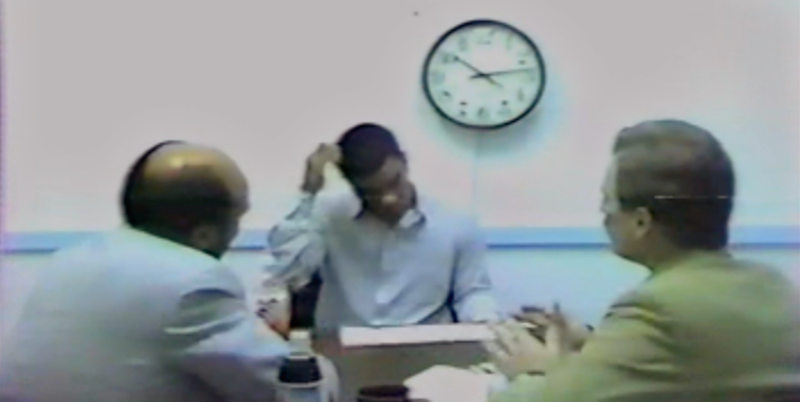 The series trains its lens on the confessions themselves, using old interrogation videos to zoom in on the details of how these “confessions” come to pass. The footage is at moments infuriating, even bizarre. In one interview, a detective interrogates Lecester “Buddy” Woodall, the nephew of man shot dead in rural Georgia. The detective’s theory is that Woodall witnessed the murder and did not stop it. 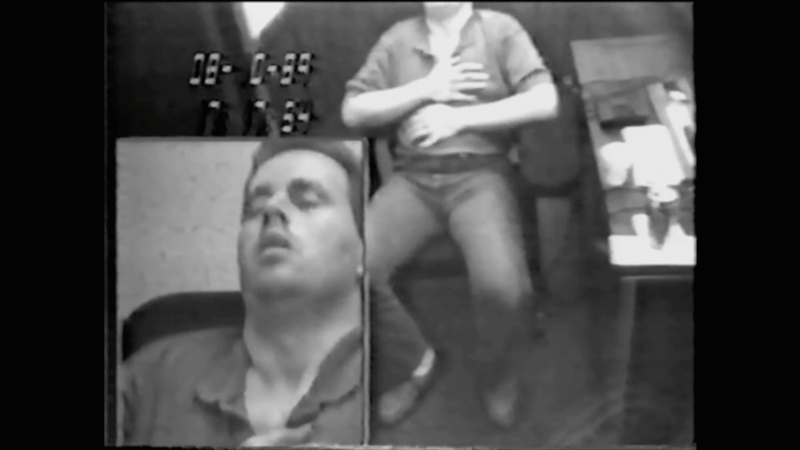 Each “confession tape” contains similarly unreal scenes: Teenaged murder suspects are lured into implicating themselves by undercover cops posing as mobsters, who by turns intimidate the boys and promise salvation; a man named Lawrence DeLisle, suspected of deliberately driving his family into the Detroit River, appears hypnotized, or verging on madness. The combined effect of these tapes is of slippery truths and language as manipulation, in which an interviewer separates words from reality—and thus, conceals the very real repercussions of a confession. “I was really interested in how language is used to alter someone’s memory or perception of what happened,” says Kelly Loudenberg, the series creator and director. Loudenberg is a 32-year old filmmaker, journalist, and visual artist from the hardscrabble south side of Augusta, Georgia, who studied journalism and cinema at NYU. Her work is informed by growing up “exposed to people who had struggled their whole lives,” amidst trailer parks laid out over swatches of red clay, the smell of pine trees and paper mills thick in the air. Seeing her neighbors’ burdens fueled her drive to amplify those unheard voices and led her toward criminal justice reporting. Loudenberg cites Errol Morris’s Thin Blue Line as an influence, and also Akira Kurosawa’s Rashomon, which portrays a single brutal act from four different points of view. Like Rashomon, The Confession Tapes investigates the philosophy of justice by highlighting divergent interpretations of an event: “how alternative narratives are introduced and then perpetuated, and then how hard it is to undo those narratives once they’re placed into the world,” says Loudenberg. Choosing narratives that have not been undone was a deliberate cinematic choice: None of the defendants from The Confession Tapes were exonerated of the crimes to which they confessed. Many of the defendants are still behind bars. And in each case, the confession was the main piece of evidence that sealed their conviction. Pursuit editors Kim Green and Hal Humphreys spoke with Loudenberg by phone about her vision for the series, her two-year investigation, and her motivations for telling these stories. GREEN: Why did you choose this topic? Was there a true-crime story that inspired you? LOUDENBERG: Making a Murderer wasn’t out when I had my first conversation with Steve Drizin about false confession cases. I had this idea before I saw that show, but the more I researched it, there was no turning back. I knew I had to make it. It’s one of those things where once you learn, you can’t really turn your eye. HUMPHREYS: How did you go about tracking down archival material, finding witnesses, and getting interviews lined up? With tracking down jurors and witnesses, that was really just investigative work. These are cases that are thirty years old, so it was really hard. We would get on Spokeo and would just find the cousin of that person. We would text or email. And people responded, for the most part. HUMPHREYS: Tracking down people, that’s probably 75 percent of my job. How did you make the initial approach to people? GREEN: What surprised you as you studied these cases? LOUDENBERG: I was surprised at how little evidence someone can be convicted on, or no evidence at all. It’s circumstantial evidence that, to me, doesn’t say anything. That, and a confession. I was also shocked at the amount of junk science used that has since been discredited, and the system doesn’t correct it. Once they’re convicted, it’s really hard to get them out. And there’s the use of the polygraph. People that are naïve and they don’t know that the polygraph is not…science. It’s not reliable, and they believe it. And [detectives] can come back in and say, “Well, you failed this miserably. This machine doesn’t lie.” Then they really start to confuse you. In the REID Technique book, they actually show you how to lay out the interrogation room, where to position the chairs. We saw that a lot in the videos, where the cops were sitting and their body language towards the suspect, and putting a hand on their knee. But with the language, it’s hypnotic. It’s trippy. You enter into a parallel universe. When I was reading some of these transcripts, I felt like I was dissolving … That’s when things get dicey, where you start messing with someone’s memory. Having them go through exercises, where, OK, walk us through your dream, imagine you’re dreaming this. Then you really start replacing someone’s memory, and injecting so much doubt in their version of events that they start questioning their own memory. Really, your memory can crumble pretty easily after that. So it kind of gets to this really crazy place of trickery through language. I would love for people to see all these tapes. It’s a process of breaking someone down. It’s strategic. There’s a goal. It really isn’t about getting to the truth. It’s about getting a confession. HUMPHREYS: Did this change your mind about the criminal justice system? LOUDENBERG: I began to wonder how many more innocent people might be locked up. Maybe not because of a false confession, but because of eyewitness misidentification, or for so many reasons. And then there are all these people who plead guilty that are actually innocent. We have no way to even know how many people. So I guess for me, it was just really depressing, a dose of reality that I wasn’t expecting to get. It affects your outlook on the world. It opens your eyes. HUMPHREYS: After doing this series, can you imagine yourself admitting to something you didn’t do? LOUDENBERG: Well, I think I would get a lawyer for sure. But I could still see myself confessing. I mean, if you just lost a loved one, if you’re in a state of shock, and you get into that intimidating space of an interrogation room with a police officer, or two or three, and they start introducing ideas to you, confusing you—I don’t know, it could happen to me, too. I felt an extreme amount of empathy, like “Wow! I can see this happening to me.” And who would be there to advocate for my cause? Would anybody care? GREEN: What would you say to the detectives, prosecutors, and forensic experts, featured in the series, who seemed so confident in their theory of the case? LOUDENBERG: I would ask them to take a more nuanced look at these cases and reconsider what they thought. Like the fire expert in the Karen Boes episode, [he] spoke with such certainty. Like he couldn’t be wrong. That’s a dangerous tone to have. It’s a dangerous way to look at things, where you can’t see that there can be some gray area there. GREEN: Another disturbing thing is that there’s sometimes pressure on law enforcement to view a tragic accident as a deliberate act, as a crime. GREEN: None of these defendants had a “happy ending.” How do you feel about that? LOUDENBERG: It is really unsettling. I hoped that it would make people uncomfortable, and it’s the reason I decided to focus on cases that didn’t have an exoneration. I wanted cases that were older, but where that person is still sitting behind bars. That was a purposeful thing—to draw attention to the many more people [who] might also be in a similar situation. GREEN: You didn’t want people to be comforted by the notion that the system will “work” and fix its mistakes. LOUDENBERG: In the 8th and H case that went to the Supreme Court, I thought that was going to be a positive decision for them, and that I would go back and film them getting out of prison and going back with their families. I thought that would be the happy ending. I thought people would watch all [the episodes] and then get to that one and be like, “Great! OK, it works sometimes.” It unfortunately didn’t work out that way. And then Wesley [Myers] was cornered into pleading guilty and having to ultimately confess a third or fourth time, having to lie again. That broke my heart. Honestly, I would like to have had some hope, but it didn’t work out that way. I hope that one of these cases finds some relief in my lifetime. We shall see. I’m hopeful. GREEN: How would you like to see the system change? LOUDENBERG: I think the mandatory recording of interrogations or interviews from beginning to end would be a really positive change, and then we could see the whole thing and make a judgment. But also, a lot of times I think police officers assume someone is guilty in these interrogation settings, and I think there’s another way to do it. I think that we could do a more interview style of questioning. It’s too risky to keep going the path we’re going, because we know it elicits false confessions. And we know that those confessions are used to convict innocent people. Juries weigh that more heavily than they do other evidence, and it happens with such frequency. To me it seems there has got to be another way. GREEN: How do you deal with your own biases and tell a story fairly, even when you have your own feelings about the issues and the people involved? LOUDENBERG: I come at everything with as much love as I can, and understanding, and respect. I came at [this series] with a genuine sense of curiosity and openness. The prosecutors and the police officers, they all had their reasons for feeling the way that they do, and I wanted to learn about it. I was just trying to give everyone an opportunity to speak. GREEN: What was your overall vision for the series? LOUDENBERG: It’s a show about false confessions. The confession in all of these cases has outweighed other evidence. We had to talk about the other evidence, the intricacies of the case, but the vision was to make this about the confessions. And it had to be centered on the tape. The tape needed to be looked at again and understood differently. That was the goal. It was our springboard. It was our grounding: that tape. This interview was edited for brevity and to make the interviewers appear focused and coherent.